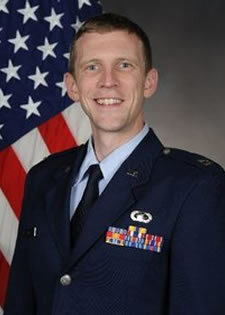 AFIT Bio for Maj Joshuah A. Hess, Ph.d.
Maj Joshuah A. Hess, Ph.d. Prince, E.R., Cobb, R.G., Hess, J.A., “Optimal Slew-Rate-Limited Guidance for Combined Formation Establishment and Reconfiguration of Inspector Satellite with Exclusion Cone,” AAS 17-530, Feb 2017. 27th AAS/AIAA Space Flight Mechanics Meeting February 5-9, 2017, San Antonio, Texas. Hess, J.A., Adaptive Estimation and Heuristic Optimization of Nonlinear Spacecraft Attitude Dynamics, PhD dissertation, Air Force Institute of Technology, 2016. Hess, J.A., Decker, D.D., and Lovell, T.A., Osculating Relative Orbit Elements Describing Relative Satellite Motion with J2 Perturbations, Advances in the Astronautical Sciences vol 142, 2011. Hess, J.A., Decker, D.D., and Lovell, T.A., Osculating Relative Orbit Elements Describing Relative Satellite Motion about an Eccentric Orbit, Advances in the Astronautical Sciences vol 142, 2011. Hess, J.A., Osculating Relative Orbit Elements Resulting from Chief Eccentricity and J2 Perturbing Forces, M.S. Thesis, Air Force Institute of Technology, 2011.